Held on Friday 29 March at LeisureFit’s spacious facilities, this all-welcome, age friendly, free event was hosted by the City of Melville. Anyone who attended was given the opportunity to enjoy a wide variety of static displays, activities, health checks, discussions or simply to try something new. There were ninety three exhibits to choose from and even a WA Seniors Card booth which gave us the opportunity to have our deteriorating and peeling SmartRider cards renewed. It was the perfect place to promote Y Striders and our small but dedicated team spent 4 hours chatting to interested people and handing out brochures. Right next door to the Y Striders booth was ‘Capital 101.7FM Radio’ broadcasting ‘LIVE’ at the Expo. It was a golden opportunity for our club! Kevin was asked to talk about Y Striders and the presenter plied him with questions to answer. The whole segment probably took 15 minutes and was broadcast to a huge audience. Two listeners heard the broadcast and came especially to the Expo for more information. 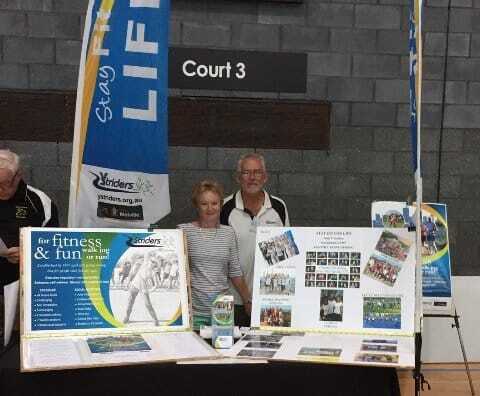 The set-up at the Expo for Y Striders was done by Kevin and Pam. They arrived an hour before anyone else and had the flags flying for Y Striders. Thank you both. Kevin dedicated six hours of his time to the promotion Y Striders. He was there at the end of the Expo to pack-up with assistance by Ken. Thank you Leonie, Ken and Elizabeth for also volunteering to help promote Y Striders. Your assistance was invaluable.